Get your summervibes moving with our refreshing summer cocktail recipe featuring the Zesty Sun that is easy to create and easier to drink! Best enjoyed on a hot day! Add vodka, Grand Marnier, Limoncello and lime juice into a shaker filled with ice. Shake vigorously and strain into chilled cocktail glasses. 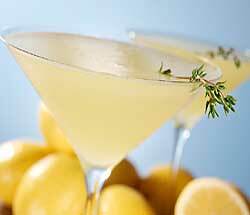 Add a splash of 7-Up and garnish with a sprig of thyme in each glass. Now, sit back, relax and enjoy your cocktail under the sun. Warning: This concoction is much stronger than it looks. Drink responsibly!